Beautiful early railroad bond Certificate #1 from the Louisville, Cincinnati & Charleston Rail Road issued in 1838. This historic document was printed by Drapel Toppan Longacre & Co. and has an ornate border around it with a vignette of an allegorical woman, a Revolutionary War hero, and a cherub between South Carolina's state seal. This item has been hand signed by the Company�s President, Robert Y. Hayne and Treasurer, and is over 178 years old. Professionally re-enforced on back. The State of South Carolina was one of the first to realize the economic benefits that could be gained by aiding the construction of railroads, and the State loaned $100,000 to the fledgling South Carolina Canal & Railroad Company (chartered in 1827) to build a 136-mile road from Charleston to Hamburg, which was completed in 1833. It was then the longest line in America. In 1835, hoping to further improve the transportation of cotton from the Deep South northward, a new railroad was chartered, the Louisville, Cincinnati & Charleston. 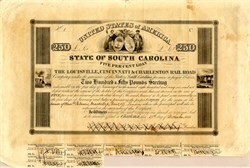 In 1838, to encourage the expansion of the road to the state capital, Columbia, the State of South Carolina agreed to guarantee the issue of 200,000 Pounds of 5% Sterling Railroad Bonds for every $500,000 worth of shares sold. The bonds, due in 1866, were to be sold in Europe through the Agency of the Bank of the United States. These are the first known state guaranteed railroad bonds. Because of the steadily worsening condition of the Bank of the United States, a second group of bonds was issued through a different agency, of the House of Mess. Palmer, Mackillop, Dent & Co. of London. In his capacity as State Comptroller, William E. Hayne signed the back of each bond. His father, Robert Young Hayne, signed as president of the railroad. Robert Young Hayne (1791-1839) was U. S. Senator from South Carolina (1823-1832) and Governor of South Carolina (1832-1834). He was noted for his brilliant debate with Daniel Webster over the Nullification Doctrine in the Tariff Controversy of 1832. The Louisville, Cincinnati and Charleston Railroad was an antebellum railroad that served the Southeastern United States. The Louisville, Cincinnati and Charleston was chartered in 1836 to construct a railroad from an intersection with the Charleston and Hamburg Railroad to a point on the Ohio River near Cincinnati, Ohio. Partly because the company was unable to obtain a charter through all states on the planned line the original plan was abandoned. Former South Carolina Governor Robert Y. Hayne was named the first president of the Louisville, Cincinnati and Charleston, and other board members included John C. Calhoun and Robert Mills. In 1840, James Gadsden became president, a position he held for 10 years. Gadsden was a proponent of a Southern transcontinental railroad and was convinced it would be necessary to purchase a strip of territory along the Gila River from Mexico to make that project a reality. as Minister to Mexico, he negotiated the Gadsden Purchase, which enabled the United States to buy more than 45,000 square miles (120,000 km2) of land from Mexico for $10 million. In late 1837, the company purchased the 136-mile (219 km) Charleston and Hamburg Railroad from the South Carolina Canal and Rail Road Company. The following year, the carrier began construction on a line to the South Carolina Midlands and the carrier reached Columbia, South Carolina, in 1842. In 1844, the Louisville, Cincinnati and Charleston Railroad purchased the stock, road, and corporate privileges of the South Carolina Canal and Rail Road Company for $2.4 million, and in 1844 the two charters were united by an act of the South Carolina General Assembly under one corporation, known as the South Carolina Railroad Company. History from OldCompany.com (old stock certificate research service), WWI Liberty Bonds Buyer and R.M. Smythe.